R-L: Abia State Governor, Dr Okezie Ikpeazu, Rivers State Governor, Nyesom Ezenwo Wike, Ebonyi State Governor, Dave Umahi and Director General of National Council for Arts and Culture, Otunba Segun Runsewe during the closing ceremony of NAFEST RIVERS 2018 in Port Harcourt. 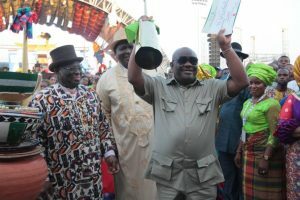 Rivers State Governor, Nyesom Ezenwo Wike celebrating the emergence of Rivers State as the overall winner of NAFEST 2018 in Port Harcourt on Saturday. Spectators during the closing ceremony of the NAFEST 2018 in Port Harcourt on Saturday. 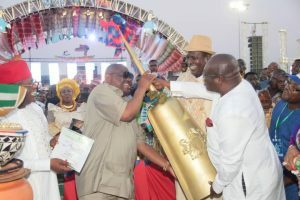 Abia State Governor, Dr Okezie Ikpeazu (r), presenting the gong to Rivers State Governor, Nyesom Ezenwo Wike (2nd L) as the overall winner of NAFEST RIVERS 2018 in Port Harcourt on Saturday. With them are: Ebonyi State Governor, Dave Umahi (l) and Director General of The National Council for Arts and Culture, Otunba Segun Runsewe. 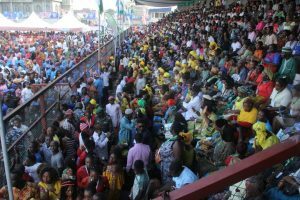 The colourful display of the nation’s culture and tradition ended on a high-note in Port Harcourt on Saturday with Rivers emerging as the overall best State at the festival. Twenty five states that participated in the fiesta showcased the diversity of the Nation at the National Festival of Arts and Culture (NAFEST 2018) described as a masterstroke by observers. At the honours role, Bayelsa State came second, Ondo State third place, the Federal Capital Territory fourth while the overall fifth place went to Delta State. 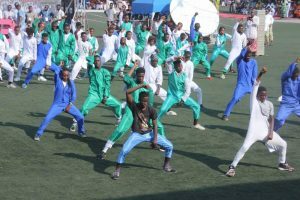 Traditional musicians, cultural dancers, traditional acrobats and masquerades displayed during the closing ceremony at the Sharks Stadium in Port Harcourt. 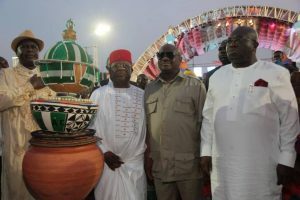 Top government officials from different states of the federation were led by the Rivers State Governor, Nyesom Ezenwo Wike, his Ebonyi State counterpart, Dave Umahi, the Abia State Governor, Dr Okezie Ikpeazu and the Director General of National Council for Arts and Culture, Otunba Segun Runsewe joined thousands of spectators to appreciate the rich cultural heritage of Nigeria. Speaking at the closing ceremony, Rivers State Governor, Nyesom Ezenwo Wike said that NAFEST is not just a competition, but a platform to promote the culture of Nigeria. He said: “I see NAFEST not as a competition, but a showcase of our diversity and cultural heritage. “Let us use culture to unite this country. The entire country is here and we are celebrating in unity. 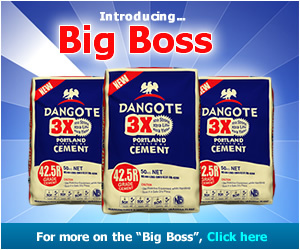 Apart from sports, culture is the uniting factor in Nigeria”. He described Rivers State as the economic nerve centre of the country, which is the most peaceful state for investment and hosting of events. “With the successful and peaceful hosting of NAFEST 2018, we have made another statement that Rivers State is safe and secure. Rivers State has hosted the PDP National Convention, NAFEST and the Presidential Visit without hitches”, he said. The Rivers State Governor announced cash gifts of five million naira to each of the participating 25 participating states..
Ebonyi State Governor, Dave Umahi said if politics and religion have failed the nation, culture will unite the country and enhance her greatness. He said that NAFEST Rivers 2018 will serve as a springboard for the greatness of the country. Speaking, the Director-General of the National Council for Arts and Culture, Otunba Segun Runsewe, said the outstanding Rivers Show proves that Nigeria is a great country. Chairman of the events, Chief Ferdinand Alabrabra said that NAFEST 2018 did not disappoint as it achieved the core objectives of the festival. He said NAFEST 2018 has set a new standard by which future events would be measured across the country. High point of the closing ceremony included the presentation of Rivers State emerging as the overall best state of the festival prizes in different categories of to winners. A colourful parade by the states marked the closing ceremony where guests were thrilled with a star performance by International Musician, Duncan Mighty, who is from Rivers State.